Answer : Should an item not meet with your satisfaction, you may return the goods to Hamelys within 7 days of receipt. Please contact us on 021 418 1077 / [email protected] to arrange. The goods must be returned to us in the condition they were dispatched, complete with all packaging and in a re-saleable state. 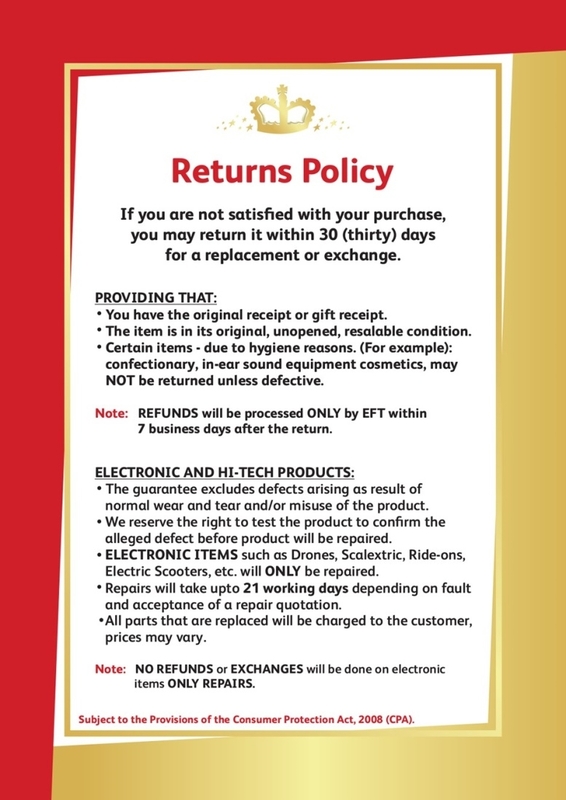 Provided that goods are returned to us in the condition they were dispatched, complete with all packaging and in a re-saleable state, you will then get a refund for the item, less all direct costs incurred by Hamleys associated with the order (such as actual delivery and admin costs, which will be taken off the amount refunded to you). A written reason for the cancellation must accompany the returned goods. Answer : According to the Distance Selling Act , you have 7 days to cancel your contract following the day of the arrival of the goods. The goods must be returned to us in the condition they were dispatched, complete with all packaging and in a re-saleable state. The goods remain YOUR responsibility until they are received and signed for by us. If an order is cancelled/returned, a 15% handling fee will be levied to cover processing/handling costs. If an unwanted product is returned and exchanged for a different product, you will be charged or refunded any price difference, and you will be charged for return shipping. Question : What about Radio Controlled goods ? Answer : All radio control items can only be returned in store. If you are not in Cape Town or Johannesburg, the issue will be evaluated telephonically and must be returned to our head office. Question : What about items bought internationally at other Hamley’s stores? Answer : These products are bought independently of Hamley’s South Africa, and are will not be refunded, repaired or returned.